Rugbylympics – our first try! Following on from the success of our annual Minilympics event, now in its fifth year, the first Rugbylympics took place on Monday 1st October at Birley’s. 62 girls and boys from five local primary schools came for a day of rugby games and mini-matches. The event was aimed at Year 6 pupils to help with the transition to secondary schools next year and was targeted at those who might not have tried rugby before. The morning’s activities involved a series of games led by Darren Reeves (who coaches for King’s and charity Wooden Spoon), designed to help develop rugby skills, and after a hot lunch they took part in a tournament to put their new-found skills into play. The feedback from the children involved was unanimous: 100% said that “the whole day was brilliant!”and many wished it had been longer. 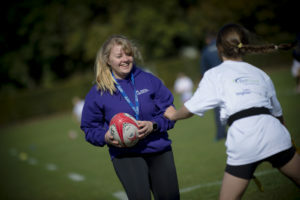 The day was a joint partnership project between The King’s School and Canterbury Christ Church University, with activities led by King’s sports staff, CCCU women’s rugby team and fantastic support as always from the CCCU Outreach Ambassadors. Thanks too to sponsors BidFood and Brighter Homes.